In the past two years, I have met some famous and very interesting people in Dubai. It is not everyday after all that you can say you've met the world's happiest man or one of the world's most creative person. So I decided to jot down my brief yet treasured interactions with them, so you can read about it, and I can reminisce a few years down the line. 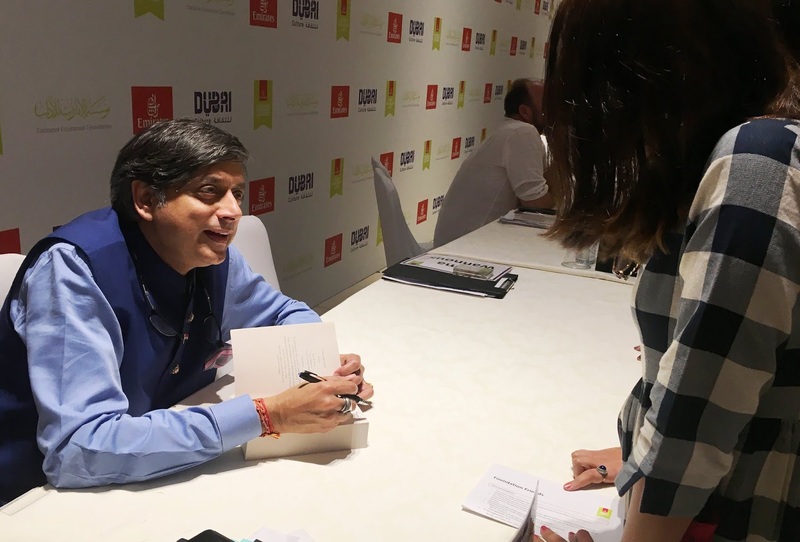 I met Tharoor shortly after I finished a heavy read of his book Inglorious Empire (read my thoughts on it here) at the Emirates Literature Festival in February 2018. I patiently made my way towards him in a snaking long queue but it was worth it because I even got snapped with him. Tharoor is highly educated, articulate and has an impressive body of social work. But he also has a long list of things he has been criticized for and accused of. Yet, in his numerous TV interviews, I have never seen him frazzled but always patient and calm in responding to hard questions oftentimes put across insolently to him. My question to Tharoor: How do you deal with criticism? I need some tips! His response: Oh I try. It isn't easy. But what can you do? You learn to deal with it. My take: I liked his honesty. He has been an idol for me, and I like when idols continue to portray themselves as real people. Shashi Tharoor too is still trying. I loved that. If you haven't heard of Weiking (pronounced viking), you've been living under a boulder. Wiking is credited for popularizing the Danish hygge and lykke in his bestselling books on these subjects. How can one be happy is something I have always pondered in different stages of my life, so Wiking, an expert on happiness was an interesting person to meet. Health, money, togetherness, freedom and cooperation are centerpoints for happiness, says Meik. So having heard that there was something else I was itching to ask, something he said no one has ever asked him before. My question to Wiking: They say you don't judge a book by its cover. You book covers though certainly deserve much credit towards driving sales - the cover designs truly elicit lykke and hygge. Do you think so too? And who designed them? His response: You know in all my interviews, I have never been asked that question before! You're right. The covers are great - I collaborated with a studio in Scotland who really understood the concepts of hygge and lykke and it reflects in the cover. My take: I simply love the cover designs; the illustrations and colors elude warmth and fuzziness. He was kind enough to even share the name of the agency with me when I met him at the book signing. Moreover, what I liked about Wiking is that he kept the concept of happiness very real, and that he is working with governments across the world to share his findings and learnings. I also like that he complimented me on my correct pronunciation of hygge and lykke. I met Fernando Machado at Dubai Lynx when he spoke to a large audience on 'Social Responsibility with a Side of Fries'. 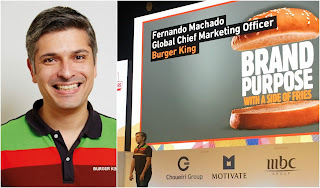 My mind was blown and my eyes watered when I listened to him speak of some of the pathbreaking social campaigns Burger King ran under his marketing leadership. His sheer ingenuity is reflected in Burger King's World Peace Day campaign. I realized only a smart and creative marketer can dare to solve world peace one burger at a time. For more on that, click here. Beyond world peace, Machado has taken on issues such as inclusion and bullying in his other inspiring campaigns. But this spurred another issue that did not come to the fore in his talk. So I asked him about it in person. My question to Machado: Burgers and fries aren't healthy. Fast food chains offer low cost tasty food to adults and children alike and that's aiding the obesity problem. Is obesity not a social issue you intend to tackle with your campaigns? His response: Burger King has a product team dedicated to researching the use of healthier ingredients in their products. There's a lot of work going on behind the scenes. This is definitely something we are working on. My take: I'm sure time-permitting, he would have had more to add. One cannot ignore the responsibility of Burger King's award-winning ad campaigns towards popularizing its products among youth and kids - and therein lies the challenge that Burger King should tackle in addressing the obesity epidemic. McCall Smith is one of my most cherished authors. Not only is he the creator of everyone's beloved character Mma Ramotswe, he is also a medical professor at the University of Edinburgh and co-founder and bassoonist of The Real Terrible Orchestra. He is humble and adds a touch of morals, philosophy and witty humor to everyday situations. His protagonist Mma Ramotswe in his globally loved No.1 Ladies Detective Agency is a strong 'traditionally built' African woman who loves red bush tea and running the affairs at Botswana's very first ladies' detective agency. Within just a few months, I read 12 books in the series devouring them cover to cover. So what do you ask your favorite author when you meet him? My question: When you were conceptualizing the story and characters of The No. 1 Ladies Detective Agency, was your choice of a female protagonist deliberate? His response: Yes, very much so. I grew up in Botswana where the women are strong and very proud of their country. Mma Ramotswe reflects that, she enjoys the simple pleasures of life and is comfortable in her skin as many African women are. My take: His response reaffirms my love for his writing and my affection for his very real common-man characters. McCall Smith peppers his stories with optimism and idealism which is why turning to his books is always an uplifting experience. Also, he has the cutest giggle and giggles generously. Mescall is the Global Executive Creative Director, McCann Worldgroup. He is the man under whose leadership McCann Australia became the world's most awarded agency. He was the top thinker on the world's most awarded public safety advertising campaigns 'Dumb Ways to Die' which has claimed legendary status. Read more on how Mescall's ingenious and universal campaign aimed to thwart accidental deaths from Melbourne's trains. At Dubai Lynx, Mescall spoke about how every small little action matters in creating something big. Do the small unglamourous things with passion. Every marketer should act and think like a human first. He encouraged young minds to not be afraid to be vulnerable - sometimes the dumbest things said lead to the creation of something remarkable. But what he said next is where my question to him stemmed from - he propagated spreading your ideas and inviting others to be a part of it. Have ambition for your ideas, not yourself, he said. My question to Mescall: You mentioned being generous with your ideas, not being protective of them. Does that not invite others to take credit for your ideas? How do you safeguard your career interests? His answer: You cannot change people's actions or intentions. That's life. You can also not change corporate culture. Your motivations should be about doing good work that benefits the wider community. Monetary benefits has never guided my career ambitions; if you do good work, the money will follow. My take: I feel protective about my ideas lest someone takes credit for them. If I can't do anything about bringing them to life, I will incubate them till I can find a solution. Mescall however woul say be generous with your ideas. He came across as a humanitarian first, and then an advertiser. But that's why I have so much respect for him. All the Cannes lions and adulation in the advertising world have done nothing to phase him away from reality. He was perhaps the most humble advertiser I have met, and I respect his ideas about working for the greater good. NOTE: All responses are not quoted verbatim. I have paraphrased them.